Reams and reams of festival laurels. Effusive critical praise. The endorsement of a major streaming platform as well as one of America’s preeminent nonfiction filmmakers. 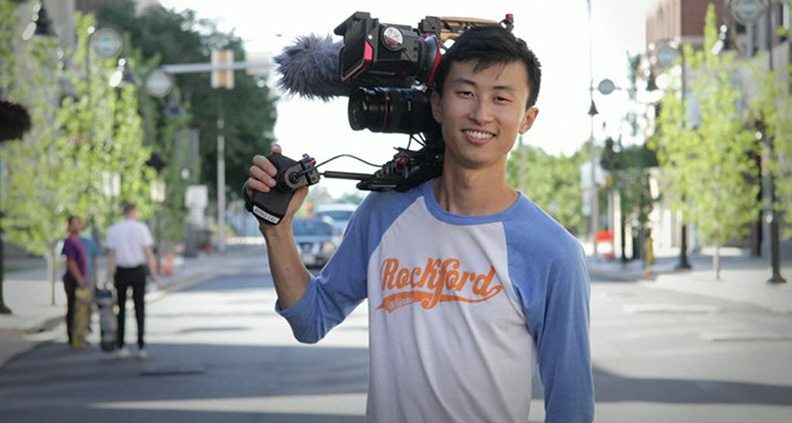 By any measure, director Bing Liu’s Minding the Gap is firmly on pace to rank as one of the most acclaimed documentaries of 2018. An evolving, years-long character study of three skateboarder friends in Rockford, IL—Keire, Zack and Liu himself—finding refuge in the sport from troubled home lives defined by issues of domestic violence, the film premiered at Sundance earlier this year, winning a Special Jury Award for Breakthrough Filmmaking. I’m curious; did you have a different relationship with your subjects as characters in a film than you did as their friend outside the film? Also, did you have reservations about sharing your own story? Liu: Not really. In terms of going into what happened with my childhood and my father, mom and brother, I felt like it was important to put that story out. I didn’t have any reservations about it. For Keire it was different than it was for Zack. Keire is about seven years younger than me, and I didn’t get to know him until we started making the film. I didn’t even know his name; he was just someone in the skating community I’d heard about. I heard about him getting into fights. He was just a kid to me at the time. Liu: With Zack, I had a little bit more of room with the relationship. We spent time at the skate park together. So there was more relationship building when I started filming with him. In both cases, they knew who I was. I was the main maker of skateboard videos in Rockford, Illinois. Everybody wanted to be in my skate videos. For example, when I was working on [Liu and Steve James’ 2018 Starz docu-series] America to Me—which is a series about high school—I built those relationships completely from scratch. Did either Zack or Keire feel weird about you following them for such an extended period of time? Liu: No. I didn’t lay it out in terms of four or five years. It had more to do with [their] current life. I wanted to make a film that explored life with your family, what it was like with your father growing up. That was it. And they were down to do that from the beginning. It was a very transparent process. I did tell them early on that they could see the final product before it went out into the world. I think that made them feel better sharing more. Diane, I think a lot of people maybe don’t understand what a producer does, particularly on a documentary. How did you help shape Minding the Gap with your input? Quon: When I met Bing, he had already been working [on the film] for many years, about four or five. So we worked with the thought of, “how are we going to raise money?” I think one of the first things we did was work on grants together, which we thought would be the main way to raise money. And then we started to work on a timeline to start doing what we needed to do. We hired crew. We interviewed composers and editors for a long time to find the right team. I was doing whatever I could to support Bing, because he had the vision for the film. Could you each speak to the logistical or technological challenges of making the film? Liu: It was four years of not really having funding. I would just go out on my own and drive out of Rockford to Chicago. Keire was a teenager at the time, and Zack didn’t have a phone for a large portion of filming. So I would try to reach him by showing up at some house, or just going to the skate park to see if he was there. But a lot of it was just taking any free time I had and going out and trying to capture their lives. I went from one DSLR to another type of DSLR to a third DSLR and finally a C-300. So it was a lot of camera shifts through the years. Quon: I just started to work with Bing a little over two years ago. He invited me to one of his shoots out in Rockford. We went from one apartment to the next apartment, and I just admired Bing so much, his tenacity trying to find them and shoot them. I think they got so used to him being there with his camera that it seemed natural to just have him there shooting. How did Steve James become involved as an executive producer? Liu: He hired me as a director on his series that follows three high school students. That was in 2015. After we were deep into filming, I wanted to show him a rough cut of Minding the Gap. He looked at it and took notes. Then time went by, we wrapped shooting of America to Me in fall of 2016. We were in New York and we did a screening. Diane and I were talking, and said we should as Steve to come on as an EP. I asked him that night and he said yes. What was some of that advice? Liu: A lot of the business side, funding and navigating things like Sundance and distribution deals. Things like press screenings and what that looks like. Demystifying it and talking about his experience so we weren’t going in blind. Can you talk a little bit about your experience in Film Independent’s Documentary Lab? Quon: Every week at the Lab they have different guest speakers and they assign different mentors to us. Even now, these mentors have stayed with the film and continued to support us. They gave us so much valuable advice. It was great to meet these folks who were successful in so many ways. Liu: It was an awesome look at sort of humanizing the industry a little bit. I mean, they brought in Pete Nicks from The Force. He talked for four hours about everything. It was just awesome and very human and down to earth. It gave us the nuts and bolts of other filmmakers’ experiences. You did Fast Track too, correct? Liu: Yeah. I felt like I was prepared for it from other meet-market type experiences. In many ways, though, nothing really prepared us for Fast Track. It was so concentrated. It was amazing. Quon: It was amazing that you’re able to meet with 60 different companies. If you tried to reach them on your own, it would be difficult. To meet with all of them within three days, it was a great opportunity. And now Hulu has acquired the film. I was curious why that platform made sense for you and for Minding the Gap. Liu: I mostly think it was that Hulu wanted to work with public television, which was our major partner in making the film and getting the film made. In this new age of distribution, I think someone has got to lead the charge and make the traditional modes up to date with streaming. So Hulu was willing to partner with our PBS producers to make the streaming deal. The second part was that Hulu has a very young audience—they give free subscriptions to new college students. And that was the audience I wanted to reach since the beginning. Quon: It seemed to compliment PBS’s audience and Hulu’s too, they had a willingness to work with the partners we already had. I think they really demonstrated their passion for this film and getting it and understanding it and wanting to support it. It meant a lot to us. Minding the Gap will be available to stream on starting Hulu today, Friday, August 17. For more information, please visit the film’s website. For more about Film Independent’s Documentary Lab and Fast Track programs, click here.